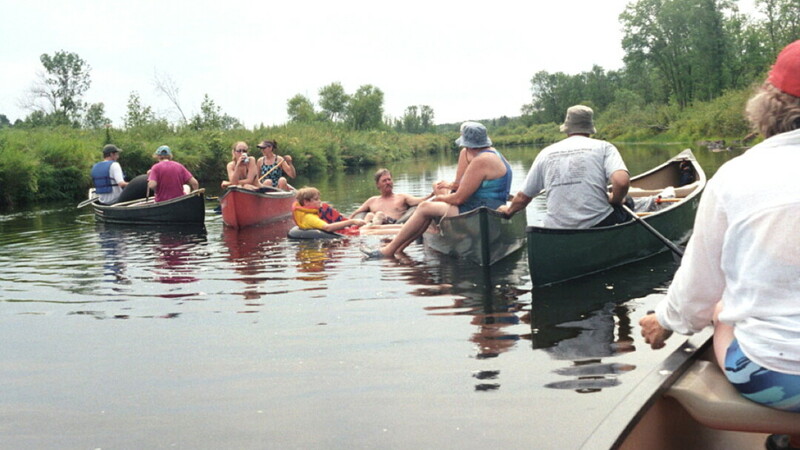 Canoeing the rivers of Northern Wisconsin has been a tradition for children in our family since the 1930s. 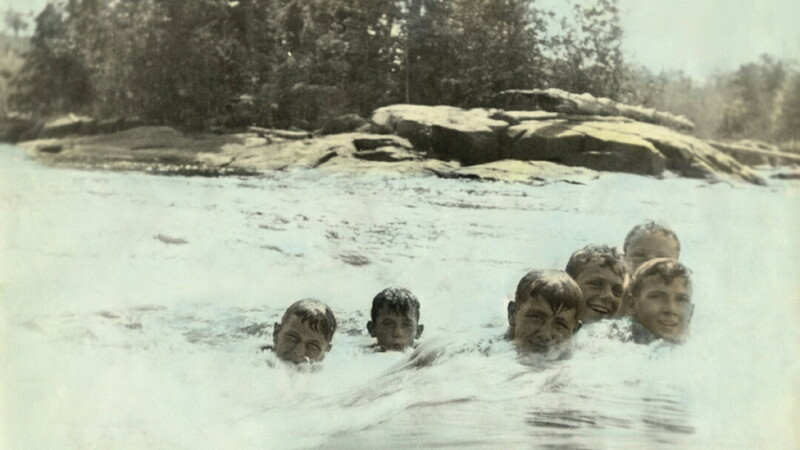 I have a tinted picture of my dad and his cousins swimming in the Cedar Falls Rapids of the Flambeau River in the 1930s when they were teenagers. For those who have never experienced the tranquility of canoe travel or the excitement of shooting rapids, it’s something that a child shouldn’t miss. It’s true that in our competitive age, the canoe is a bit clunky – a kayak can take far more challenging rapids and speedboats go much faster. But for seeing the sights at your leisure, savoring the north woods, carrying your food and cameras, chattering with family and friends, horsing around on the water, and traversing shallow rivers, canoes can’t be beat. My dad and his family clan of boys would take their canvas canoes – packed with tents, sleeping gear, and food – for a week and rough it. Roads were less developed and other canoers far less common. In the 1950s and 1960s my generation and our parents would periodically bang around on the rivers. In the latest canoeing revival from the early 1990s, we’ve moved to a succession of day trips from a central camp each summer, a better approach to pre-teens. We’ve had great fun introducing our children to Wisconsin rivers. We canoe in mid-summer when the air and water are reasonably warm. Although there are people that are more skilled at paddling and steering a canoe, it’s not hard to learn. We now find a hospitable campground for the period we’re canoeing. We plan out each day’s jaunt, drop off the canoes and most of the people at the put in site, drive all the cars where we’ll take out, drive a car back to the put in, and go to it. There are simply marvelous storied rivers available to us: the Namekagon, the Flambeau, the St. Croix, and the Bruhl. These rivers are all beautiful, a way to introduce to kids to nature – you never know what will pop up. We’ve seen eagles, otters, deer, mink, crayfish, ducks, songbirds, flowers, big trees, turtles, and various kinds of fish. We will set up on rocks or sand bars for a picnic or a plunge. Most of our rivers are reasonably shallow; when we screw up and tip over the canoe in rapids, we stand up and refloat our boat. I am a particular fan of the Namekagon River, an extremely good float for kids. It is a slower-moving and sandier-bottomed river with less-challenging rapids but fine scenery. It empties into the upper St. Croix River, which gets rockier and somewhat faster but is still picturesque. Its rapids are more challenging especially if the water is too low – then you’ll hit rocks constantly. 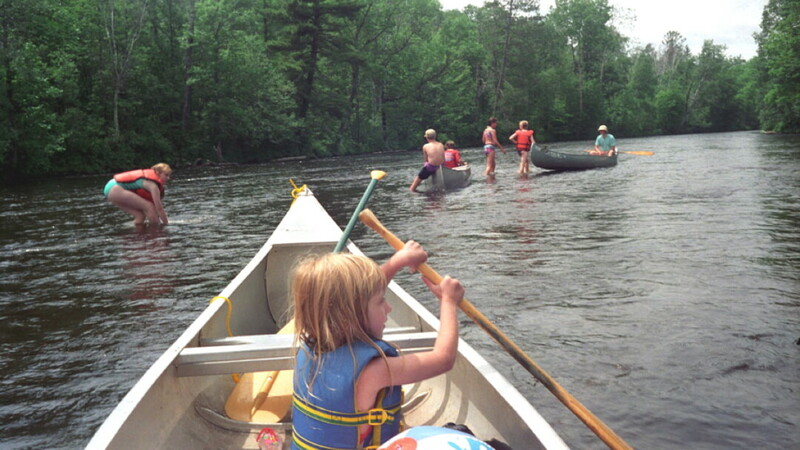 The Flambeau River has several forks and some pretty challenging rapids. The Slough Gundy section of the Flambeau in particular is a rock pile and impassable in low water and challenging if there’s enough water. The Flambeau has other sections with memorable rapids and scenery. The Bruhl River is very different depending on how close you are to where it empties into Lake Superior. The upper Bruhl is a slow-moving stream flowing through big pine trees that requires paddling to make up for a slow current. Below that it gets lively with more current and almost constant rapids. For resources finding trips on these rivers, I suggest buying Paddling Northern Wisconsin by Mike Svob, which gives maps of sections of these rivers. The National Park Service at www.nps.gov/sacn/planyourvisit/maps has maps of the Namekagon and St. Croix rivers. We use the Wisconsin Atlas and Gazetteer to find the little back roads we depend on to get to put-ins and take-outs. The rivers vary in depth based on rainfall and the water released from dams, so conditions should be checked. If the water is high enough, fewer rocks are available to hit. If the water is low, every rock in the river will rub the bottom of your canoe, making the river impassable unless you get out of the canoe and trudge through the water. We prefer rivers with sufficient water and a current so we can let the river do most of the work. Our current problem is that our kids – our best canoers really – are growing up and having kids. We’re in an awkward period where their children are too young to sit in a canoe. Once we can hand the youngsters a paddle in a few years, our canoeing forces will be renewed. Canoe technology has changed. 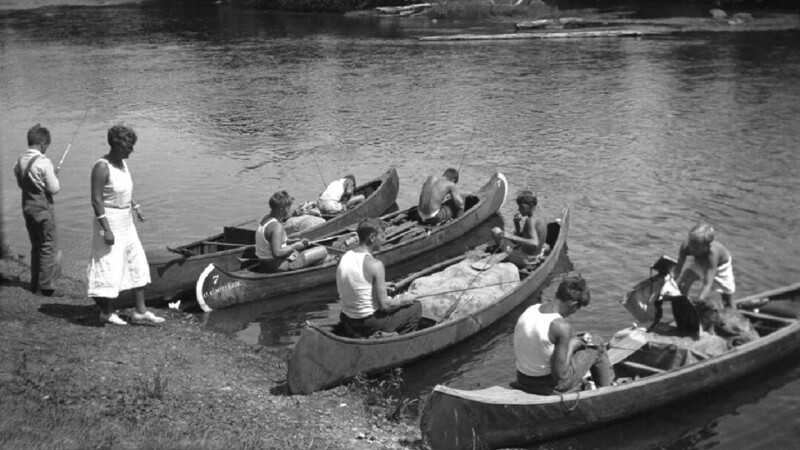 Canvas canoes were the thing in my dad’s day but it was easy to put holes in the fabric – they were high-maintenance. We’ve use aluminum ones but they don’t appreciate hitting rocks – we’ve had them pop rivets – and they report our failures too loudly when we strike rocks. We generally use the strong resinous plastic canoes – mostly Old Towns in our case – which stand up better to the punishment we give them. The rivers are ever changing and fascinating, and there’s something uniquely soothing about water. A canoe’s slow pace and gentle ways are a perfect for kids to play. It’s an intimate introduction to Wisconsin’s waters, woods, and land. I have fond memories of playing and somewhat seriously paddling on the rivers. We will make sure there’s canoeing in our childrens’ future to maintain the tradition and the fun.